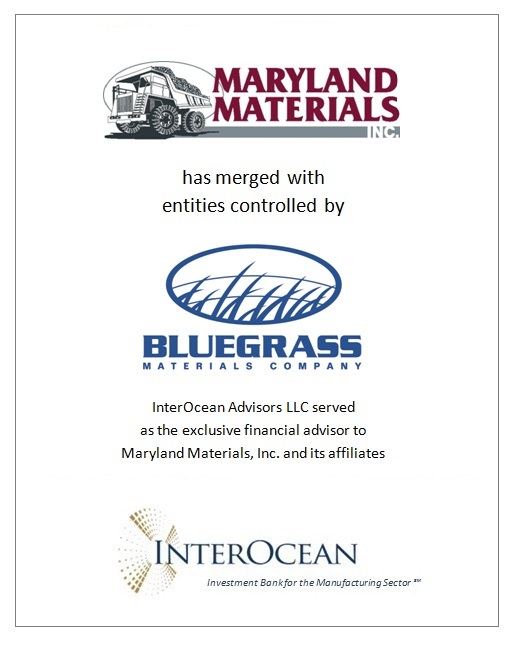 InterOcean Advisors LLC (“InterOcean”) announced today that Maryland Materials, Inc. and its affiliates (collectively “MMI”) have successfully merged with entities controlled by Bluegrass Materials Company, LLC. InterOcean served as the exclusive financial advisor to MMI. MMI is a high-quality granite and trap rock quarry with significant aggregate reserves. The company offers a complete line of crushed stone products used in construction site development, highway projects, and the production of hot mix asphalt and concrete. Products are supplied to customers in Maryland, Delaware and the surrounding markets through multiple distribution methods, including truck, rail and barge. Maryland Materials, Inc. was founded in 1959 and is one of the largest independent aggregates quarries in the United States. Located in North East, Maryland, MMI produces a complete line of crushed stone products from granite and trap rock reserves. Bluegrass Materials Company, LLC is a wholly owned subsidiary of Panadero Aggregates Holdings, LLC (“Panadero”). Panadero was formed in 2010 by John D. Baker II and Ted Baker II, formerly of Florida Rock Industries, to acquire, develop and operate aggregates and other related construction materials businesses. The company currently owns and operates seventeen rock quarries and one sand plant plants located in Kentucky, Tennessee, South Carolina, Georgia, Pennsylvania, and Maryland. InterOcean Advisors LLC is a Chicago-based investment bank that provides mergers and acquisitions and capital raising advisory services to manufacturing and business services companies. For more information, please visit www.ioadvisors.com.